One of modern music's towering figures, composer and multi-instrumentalist Anthony Braxton has redefined critical concepts of jazz and the wider world of creative music. The Chicago native's works range from an early piece for 100 tubas to proposed compositions for orchestras on different planets. A modern classic, Forces in Motion follows Braxton's lauded quartet on a 1985 tour of England, noting his opinions of his musical predecessors -- including Charlie Parker, John Coltrane, and Karlheinz Stockhausen -- as well as his thoughts on racism and poverty. For this new 30th anniversary edition, Graham Lock provides a new chapter, detailing later encounters with Braxton and the quartet; Anthony Braxton has penned a new Afterword as well. In addition to inside views of the mind of a musical visionary, this book offers an entertaining chronicle of a touring band. Braxton's subjects run the gamut from chess and hamburgers to astrology, feminism, and ancient Egypt. Above all, it offers a captivating view of the frustrations and rewards that result from an artist's dedication of his life to creative music. "This book should be required reading for anyone interested in my music," Anthony Braxton has observed. "Graham Lock writes from the perceptual plane of insight and dedication -- coupled with a keen wit and a dynamic intellect. This is serious writing and thinking. I could not have been more fortunate." Graham Lock is a freelance writer specializing in music. He has been a research fellow at Nottingham University, deputy editor of The Wire and a contributor to numerous magazines such as Critical Studies in Improvisation, Gramophone, International Piano, Point of Departure and Sound American. His books include Blutopia, Chasing the Vibration and, as co-editor, The Hearing Eye and Thriving on a Riff. 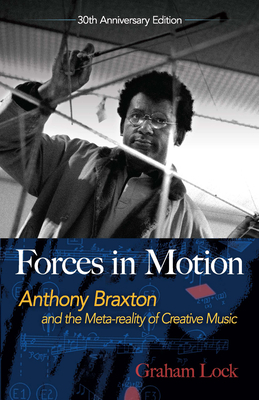 He was also the editor of Mixtery: A Festschrift for Anthony Braxton.